When my daughter celebrated her 11th birthday recently, she requested a Minecraft birthday party. We knew we’d whip up the lava punch Minecraft party idea from her friend Landen’s birthday party. 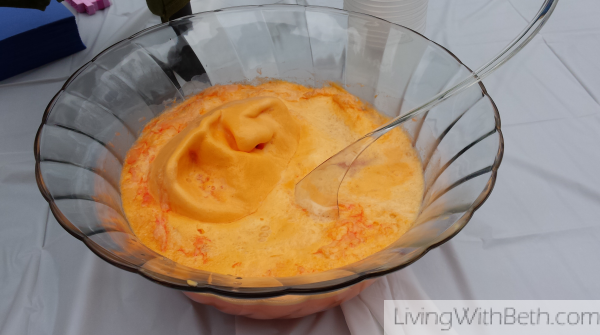 I made it by pouring Diet Cherry 7-Up into a punch bowl, then dumping in a carton of orange sherbet. Landen’s mom had made it slightly differently, but it was still very tasty and a big hit with everyone. 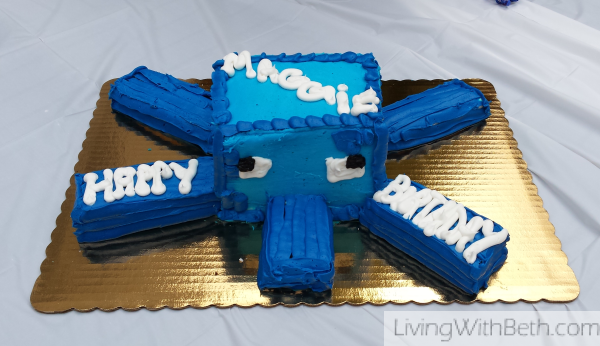 My daughter requested a Minecraft squid birthday cake, which I didn’t think was going to be possible. My sister found a picture of a squid cake online and suggested maybe we could make it, but I’m just not that brave. So, she ended up taking the squid cake photo to the Harris Teeter where she normally buys birthday cakes, and their cake decorator made a squid cake for no extra charge over what a normal quarter-sheet cake would cost. My nieces love Minecraft as much as my daughter, and they thought the squid cake was the most amazing birthday cake ever. I’d have to agree with them. We were also blessed with wonderful spring weather for the birthday party, which is often the case toward the end of March in Raleigh. We held the Minecraft birthday party outside, so the kids could play on the swingset and trampoline and run around in the backyard at my sister and brother-in-law’s house. My sister had me get blue and white balloons from Party City. I wasn’t sure how many she usually ordered, so I bought 12. She later told me that she usually gets only six, and none ever pop or escape. Of the dozen balloons I purchased, one or two escaped and several popped. By the end of the party, we had five balloons remaining. I’m not sure whether the balloons were over inflated or what happened, but it’s a good thing I bought 12! Have you hosted or attended a Minecraft birthday party? 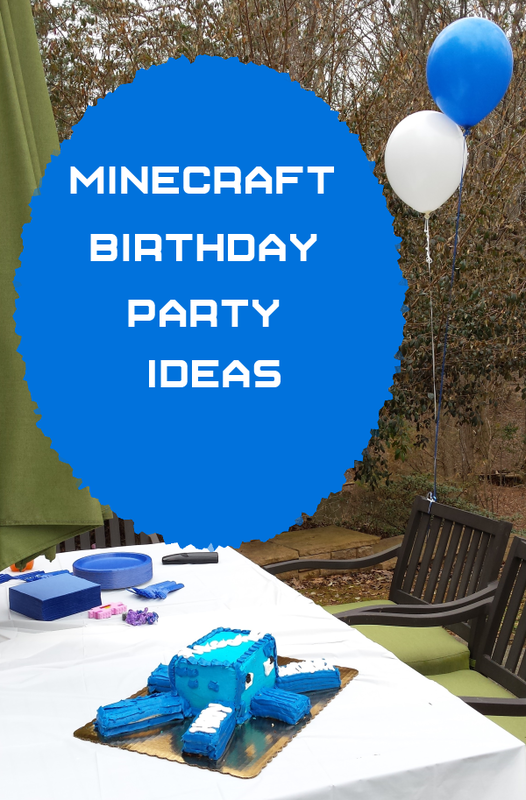 What are your best Minecraft party ideas?